Director Seth Gordon’s last movie was the very funny ‘Horrible Bosses.’ This one is just horrible. In fact, at what seemed like the five-hour point in this not-quite two-hour film, I seriously thought about leaving because this was a little too crude and too unfunny for my taste. It had been going nowhere but around until that point and it still didn’t look like it had found a sense of direction. I should have left; it did not get better. Melissa McCarthy can be very funny in an ‘out-there’ sort of way. Jason Bateman can be entertaining in a boy-next-door sort of way. But in here, they’re both victims of a flimsy, implausible plot that gives them little to do but physical pratfalls that cease to be funny after about ten minutes – but continue for much more than another hour. I thought this film was never going to end – although I kept hoping it would. McCarthy does everything she can to keep this movie alive – she sings, she falls down, she improvises – all to little avail. Bateman mostly just winces. Nobody else in the cast lives up to their potential. And then, in the end, since the contrived comedy scarcely worked, the movie tries to turn sweet and human and redemptive. Give me a break. 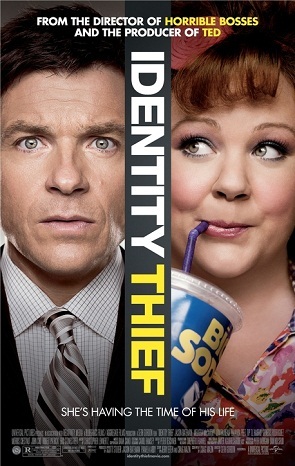 Don’t let the big box office numbers deceive you – what ‘Identity Thief’ wants to steal from you is your ticket money.